The only thing better than a cupcake is a cupcake with a rich cream filling. So, when you start out with a cupcake that is well known for having a delicious frosting – such as red velvet, which is almost always paired iwth a cream cheese frosting – you know that it can only get better when you manage to incorporate more into the cupcake. Red velvet cake is a buttermilk cake with a light cocoa flavor that gets its name from its color: red. The red in the cake comes from food coloring and the more you use the redder your cake will be. This recipe is adapted from a Cook’s Country recipe for a red velvet cake. They call for using 2 tablespoons of food coloring, which is an entire little bottle of the stuff. You can get away with using half that amount, but don’t skimp too much or you’ll lose a lot of color. If you leave out the food coloring completely, the cake will have a reddish brown tinge to it (thanks to the combination of cocoa powder and baking soda, this is where the idea of a red cake came from in the first place). These cupcakes are moist and tender, with a distinct cocoa flavor to them. It isn’t enough to make them taste like a chocolate cupcake, but it is enough to give the cupcakes a good, solid flavor. I really like this about these cupcakes because it is too often that red velvet cupcakes don’t have much flavor at all and simply trade off their unique color. With the cream cheese filling (the same as the frosting), the cupcakes become even more moist. They will keep well for a couple of days in an airtight container. If you’ve never made a cream-filled cupcake before, I have a filled cupcake tutorial that will guide you through the process. It involves removing a piece of cake from the center of the cupcake and adding filling. With this method, which only takes a few seconds per cupcake to do, you get a lot of filling in each. An alternative is to simply stick the tip of a pastry bag or a can of frosting into the cupcake and squeeze, but you don’t get nearly the same amount of filling and it doesn’t save very much time. You don’t need to do anything special to finish these off, but if you dye a little bit of frosting red, or have a red gel frosting pouch, you can add a little squiggle to the top that is reminiscent of the squiggle on the classic, cream-filled hostess cupcakes. In a large bowl, cream together butter and sugar. Beat in cocoa powder until well combined, then beat in the eggs one at a time. In a measuring cup, combine buttermilk, vinegar, vanilla and food coloring. Working in two or three additions, alternate adding some of the flour mixture and some of the buttermilk mixture to the butter mixture, ending with an addition of dry ingredients. Mix only until just combined and no streaks of flour remain visible. Divide evenly into prepared muffin cups. Bake for 14-17 minutes, or until a toothpick inserted into the center of a cupcake comes out clean. Turn cupcakes out to cool completely on a wire rack. Combine all ingredients in a large bowl and beat at high speed until smooth, gradually adding the confectionersâ€™ sugar until a thick and spreadable consistency is reached. Additional confectioners sugar may need to be added to thicken frosting, especially if humidity is high in your area. Transfer frosting to a pastry bag or a large ziploc bag with a corner cut off before beginning to assemble cupcakes. Take the cream cheese frosting and squeeze a tablespoon or so into each cupcake cavity, filling the hole up to the top with filling. Top off with a flat circle of cake to plug the hole and keep the filling in place. Squeeze some more frosting on top of each cupcake and use a small knife or offset spatula to spread it into an even layer. If you have leftover frosting, add some red food coloring to it and transfer it to a fresh ziploc bag. Cut a very small opening in one corner. Pipe a swirly line down the center of each cupcake. Thank you so much for the cookbook and other goodies! I can’t wait to try so many of the recipes. I tried browning butter for some oatmeal cookies the other day, and they’re wonderful. I have always wanted to know how to make a filled cupcake! Thanks. Your post is beautiful – my mouth waters for red velvet cupcakes with a cream filling. These look absoloutely divine! And I’ve been looking for a cream cheese frosting. Thanks for sharing. Wow! I am always so sad when I gobble up the cream cheese frosting and am left with just cake. This takes care of that problem by the addition of extra frosting in the middle. Yeah!!! Oh lord, that looks so delicious. I just gonne make them right since I actually wanted to visit my mother today and THIS is just the thing I have to take with me! I have this debbie meyer pan. 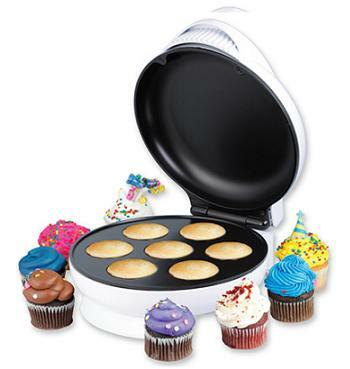 I haven’t tried it yet but I think it will work great for filled cupcakes. I also purchased the debbie meyer pan. I have used it a dozen times and it is so much easier and cleaner then cutting all of the holes out myself. Definetly a time saver. I am going to try this recipe this weekend and I will use the debbie meyer pan when I do it. I went and got the gel food coloring. Can you tell me how much of that you would use instead of the liquid? Thanks! I’m wondering if there is a typo in the frosting recipe. My frosting was running and had that look when it’s separating. We double-checked our ingredients and we had measured correctly. It’s still runny, even after adding 2 extra cups powdered sugar. Is it possible the recipe is only supposed to call for 1-8 ounce cream cheese. Thanks for any help. P.S I have made them in the past and they are AWESOME! Is it alright if I use the SaCo Cultered Buttermilk Blend? Would it still work just like regular buttermilk if I just mix the blend with water? Made these last night for my husband. I’ve never made homemade cupcakes before and I have to say, these are the best we have ever had. Ever! So moist and yummy! There is one step missing though. After you mix the flour and stuff, it never says to mix it eith the cocoa mixture. Clearly you do, but that step wasn’t in the recipe.